Ready to start reading Series from Leap Frog. Jake and the Never Land Prates. Dora the Explorer. Does not include the "reader". Tailored tutorials help teach new concepts. Counting Book. Your little one will be learning while playing. This teaches counting in a fun way! Item is sold AS IS. Up for your consideration we have one copy of Dora The Explorer Dora’s Amazing Show. It is in very good / used condition. Vroom on the go and Dora the explorer to the Rescue. Style: Dora The Explorer. Series: Early Reading Series. Type: Interactive Learning Book. Works only on My First LeapPad. v Item is Sold AS IS. LEAP and The LOST DINOSAUR. Almost all my books are from LeapFrog. This book does have a few hairline scratches that I was not able to photograph. These are very minor! Pictures 8 and 9 are showing the blemishes in the cardboard cover. Learn colors & numbers in English & Spanish. 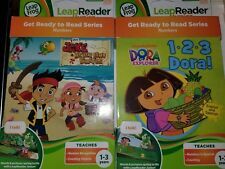 LeapFrog Tag Reading System Dora Goes to School For use with Tag Reader or may be read alone NEW in box (tape on box shows age & shelf wear). Pictures comprise part of the description. Dora The Explorer Leap Frog Baby Little Touch. A Gift from Big Sister Dora. Numbers - Counting. Discover Spanish Language. 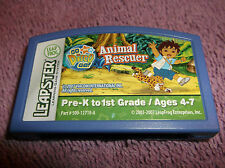 ANIMAL RESCUER NICK JR. GO DIEGO GO! ANIMAL RESCUER. PRE.K-1ST GR. 4-7 YRS DIEGO. SKIP COUNTING BY 2S, 5S, 10S.